Dear Readers, you may remember that last year I visited the latest Turbine Hall installation at Tate Modern in London. 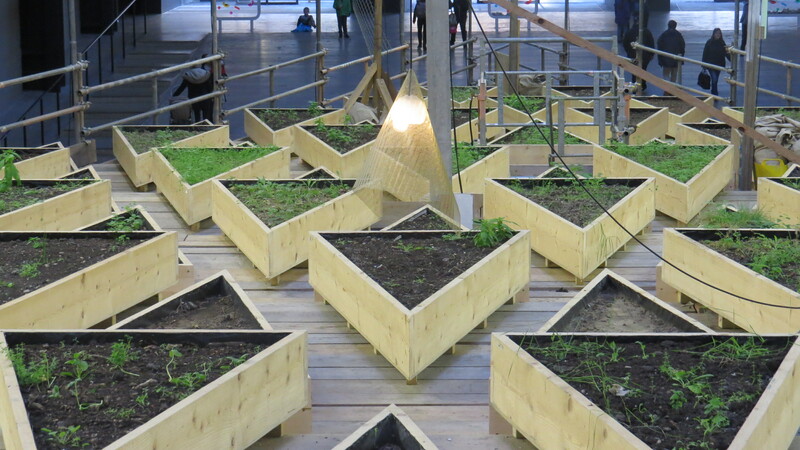 Called ‘Empty Lot’, it’s by Abraham Cruzvillegas, and comprises dozens of triangular planters, each filled with soil from different parts of London. Some contain material from allotments, some from parks, some from gardens, but none of the ‘plots’ are labelled, so it’s a little frustrating not to know which soil is from where. 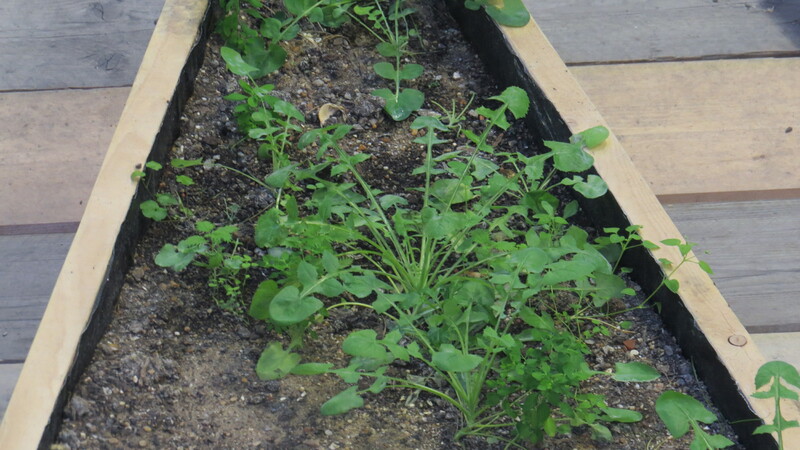 The containers are watered, and lighting is provided, but nothing is planted, so whatever grows will come from the seed bank that was there when the installation was created. As you can see, some of the triangles have produced a reasonable crop of plants, but some are completely barren. 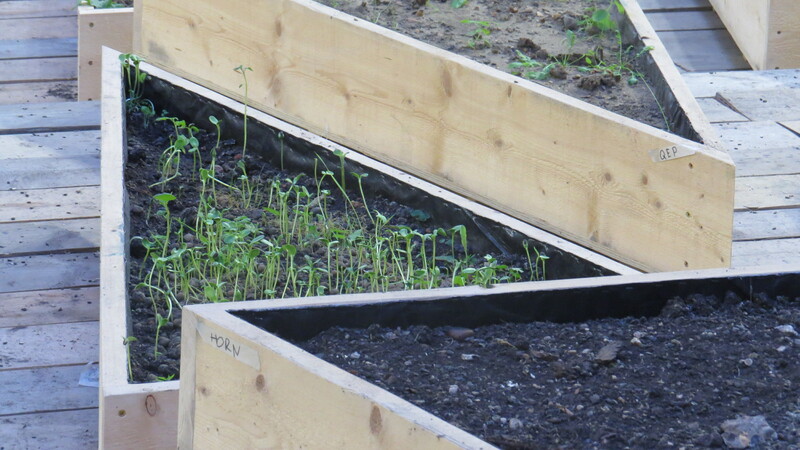 Another frustration for me is that you can’t walk among the beds, but I managed to get an idea of what has grown up in some of them during the four months since I was here last. 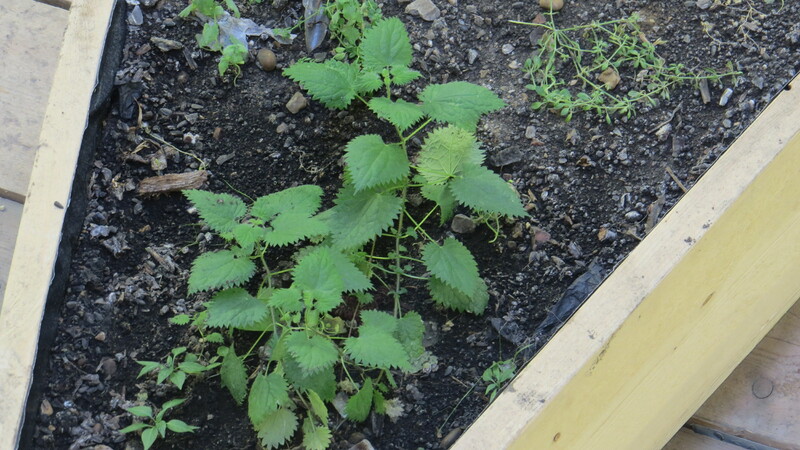 Stinging nettle. Or maybe even small nettle? Some sad nasturtiums reaching for the light…. So far, so much as expected. If I’d been a betting person, I’d certainly have put money on dandelions and nettles cropping up. But wait, what is this? Springing forth from several of the beds was a fine crop of black nightshade (Solanum nigrum). Why on earth this should be so numerous is anybody’s guess. Unless, of course, I am looking at some potato plants. Maybe any gardeners could hazard a guess? 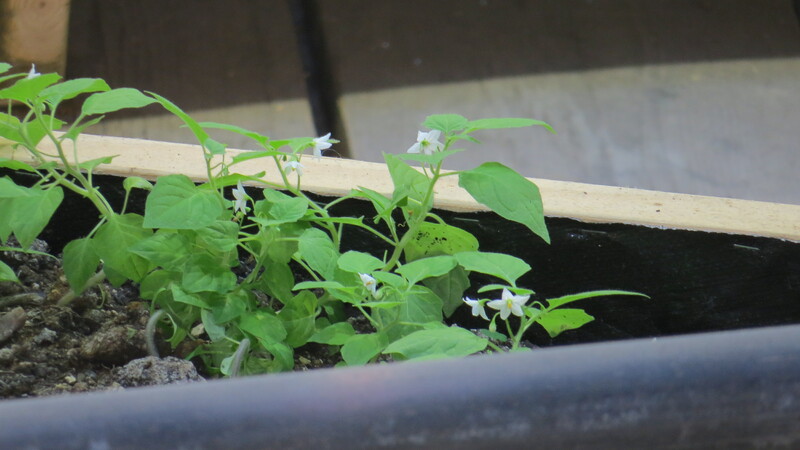 These plants look a little more delicate than the potato seedlings that I remember from my youth, but then the light conditions may have rendered them a little etiolated. Maybe the only solution is to break into Tate Modern after dark with a spade and do a spot of digging. 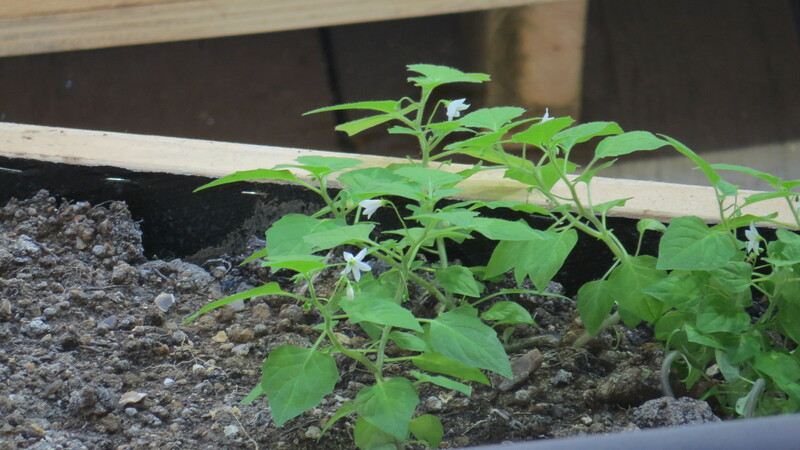 Black nightshade or poorly reared potato? The exhibition finishes on 3rd April, much to my frustration – a few more months would have seen any spring flowering plants coming into bloom, and would have made identification easier. But still, this is art, not science. Unfortunately. On the UK Wildflowers Facebook page, someone suggested repeating the experiment but with labels, and with soil taken from all over the UK, and with correct lighting levels. What a glorious sight that would be! Anyhoo, I had forgotten that it was half-term, and by this time the place was mobbed with eager small culture-seekers. You couldn’t get into the cafe for the massed ranks of prams and little ‘uns. 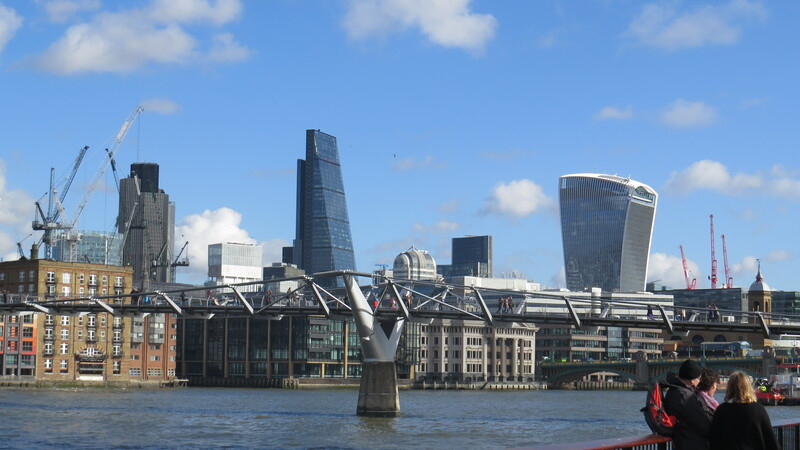 So, I decided to go for a walk along the Thames, heading back towards Waterloo. An elderly man sat on a bench just past the gallery, and produced a carrier-bag full of crusts for the pigeons, which they hoovered up in ten minutes. No wonder they look so sleek and well-fed around here. There are so many small treasures along this one mile walk. Take the lanterns, which, although called ‘Dolphin lights’, are actually said to represent sturgeon, though they don’t much look like them, either. 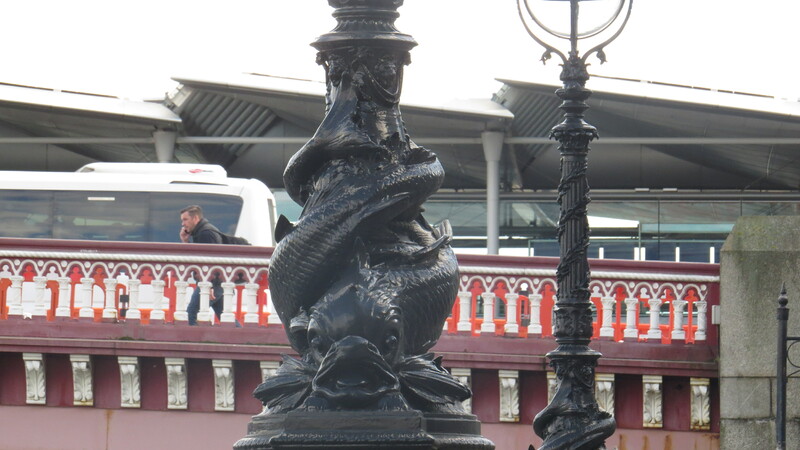 The lights on the north side of the river date from 1870 and were designed by George John Vulliamy, but the ones on the south bank are replicas, made to commemorate the Queen’s Silver Jubilee in 1977. 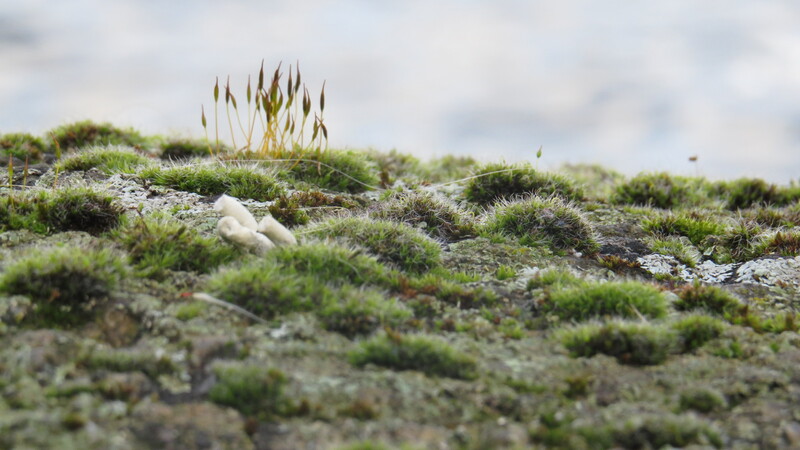 And on some parts of the embankment railings there are veritable miniature forests of moss. It’s easy to forget that the Thames is a tidal river, and that sometimes little miniature beaches appear. 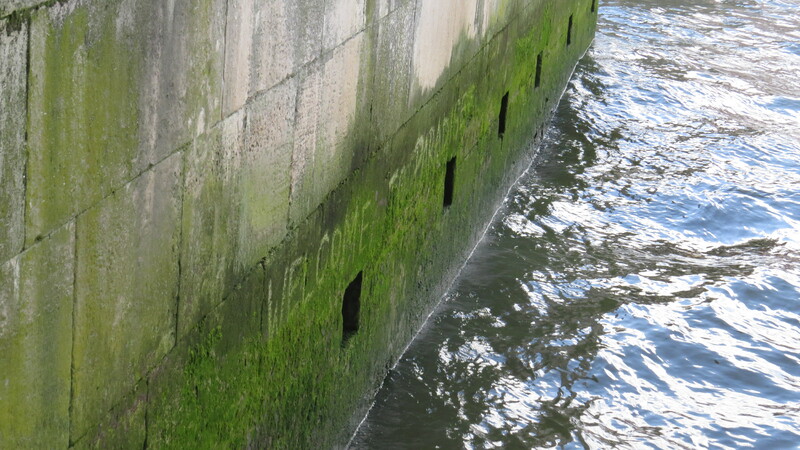 The lettering on the embankment below, almost hidden in the algae, says ‘Welcome to Paradise’. I don’t know if there is ever dry land here, or if someone wrote the message from a boat. Very intriguing. The lettering says ‘Welcome to Paradise’. 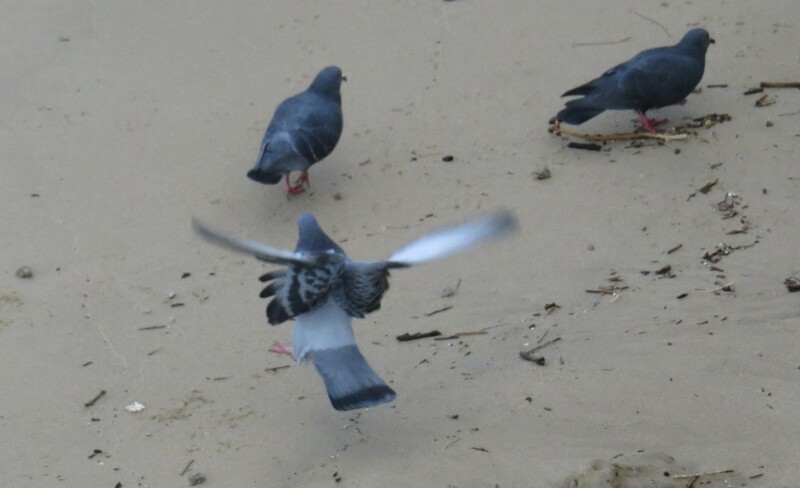 And here is one of the little beaches, being pecked over by the usual suspects. 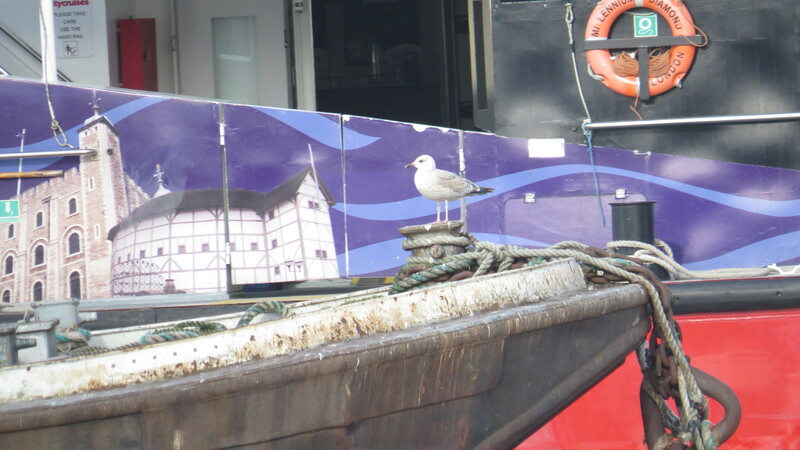 The Thames is a great location for gull-watching – you never know who is going to turn up. 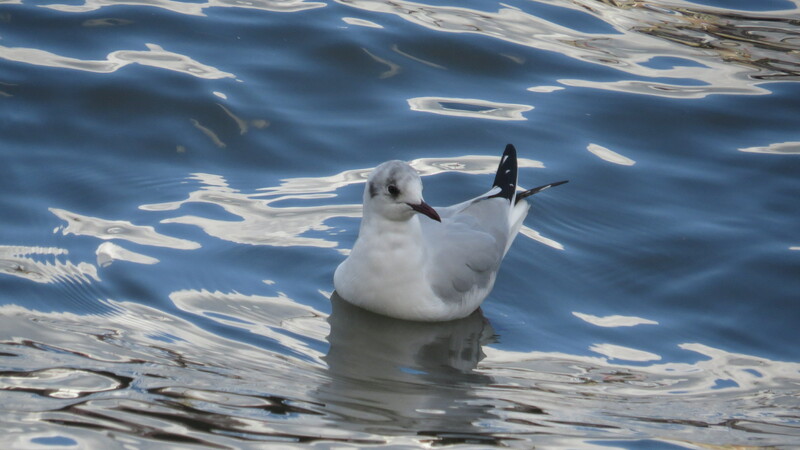 But the commonest birds at this time of the year are the black-headed gulls, who ride the waves breast down and tail up, like paper boats. They are not averse to picking over what the tide brings in either. To my surprise, most of it seems to be organic matter – branches and weed – although of course there are also plastic bottles and other tat. 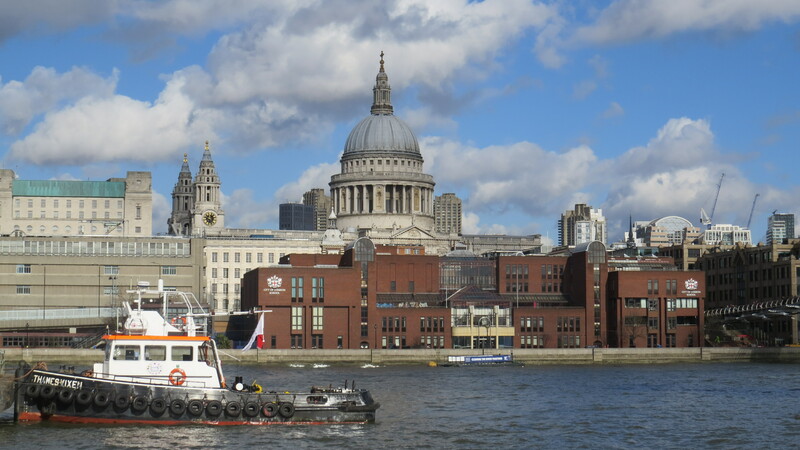 The Thames is still full of surprises -everything from Roman coins to clay pipes to Delftware. A man wearing a woolly hat was standing on the beach, mobile phone clamped to his ear, spade upright beside him in the sand. I wonder what he found? 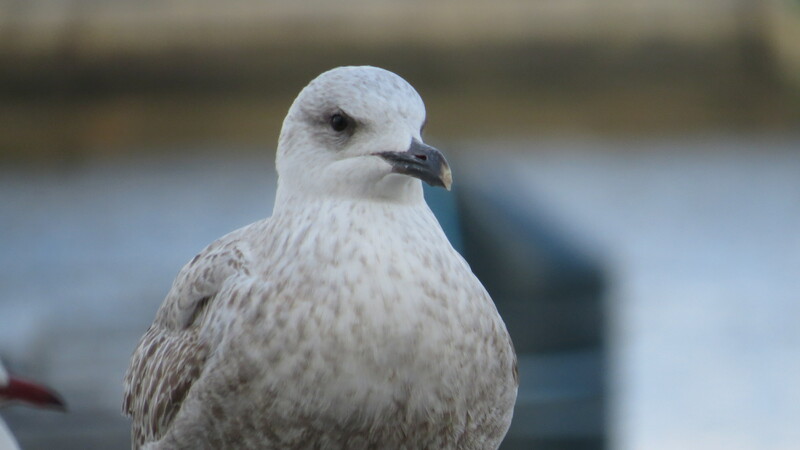 A family just along the path had brought out their lunches, and were immediately besieged with pigeons at their feet, and gulls perching on the railings, watching every mouthful with a beady eye. When people walked past they flew up in a flurry of paper-white wings, squealing and chuckling. It’s not wise to show these arch-scavengers a crust unless you’re serious, because they are not above distraction tactics, and will nick half a sandwich as soon as look at you. They, along with squirrels, are the animal equivalents of Dicken’s urchins, innocent looking but with petty crime on their minds. 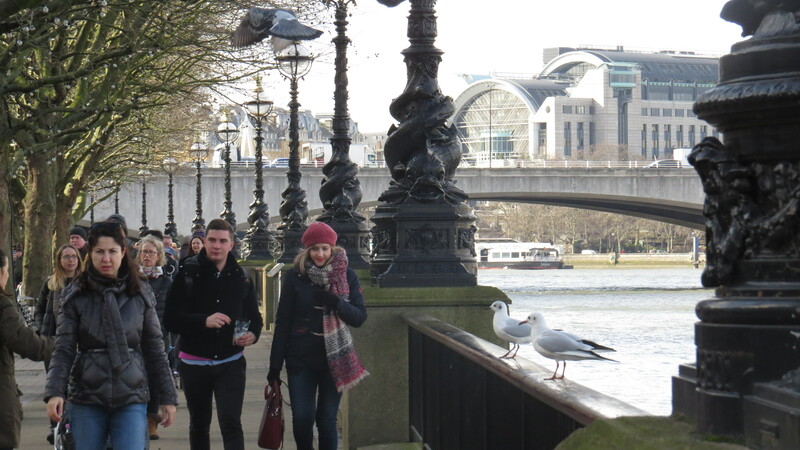 And yet, watching the gulls against a backdrop of olive-green water and the warm stone of St Pauls, they looked more like angels. Onwards! 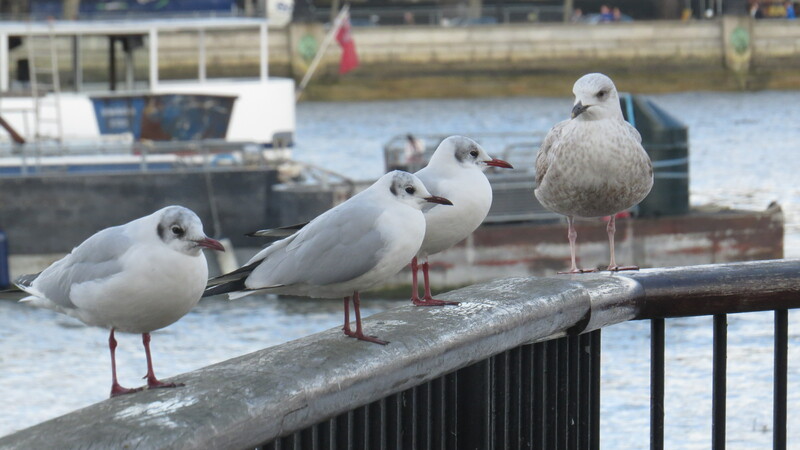 And just before the National Theatre there was a fine group of gulls perched on the railings – three black-headed gulls and a young lesser black-backed gull. You could argue that this was a combination of beauty and the beast, for the lesser black-backed gull is twice the size of his companions, and bears a beak meant for butchery rather than for picking things over. 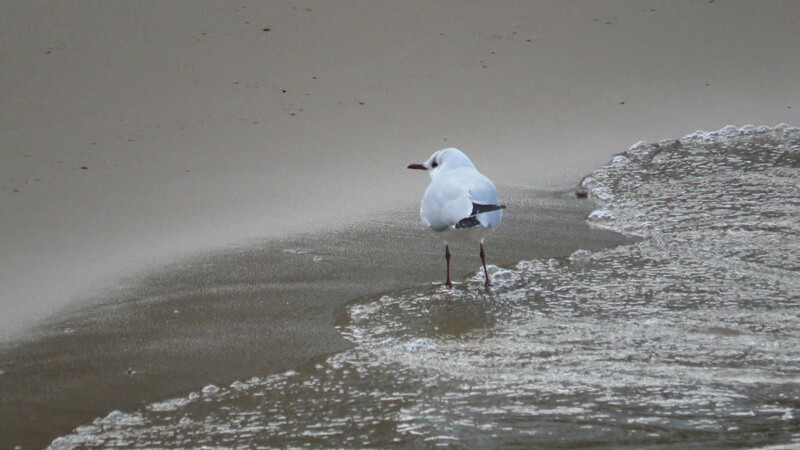 Still, this is a young gull, with speckled wings, not yet ready for the piracy of his adulthood. He stands quite companionably with his smaller companions as they preen their feathers and keep an eye open for biscuits. I get quite a few photos of the little group as they sit there peaceably while the endless stream of tourists walk past. The birds have the disinterested look of market-stall holders who have already sold enough for the day, and are watching the world go by without comment. 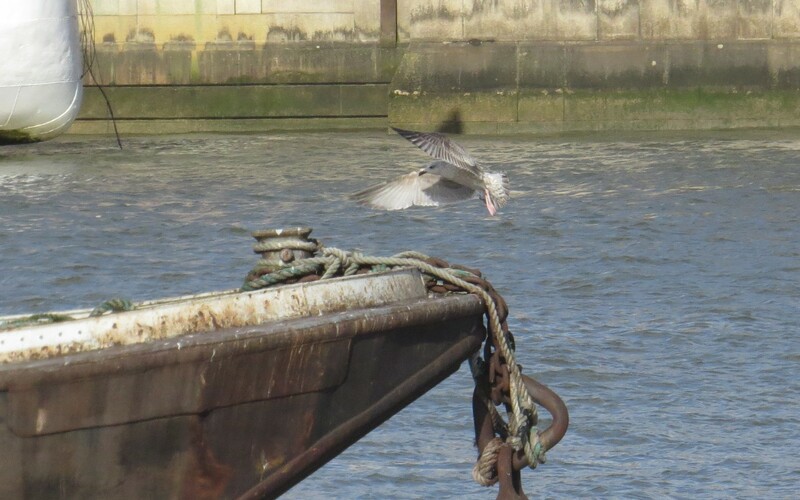 And then, the lesser black-backed gull unfurls his wings and, unhurriedly, lifts his pink feet from the railing and leans into the wind, which carries him off across the river. He lands on the prow of an ancient barge, and settles himself. Maybe he is dreaming of hot-dogs. Or maybe his mind is as clear as water. Information on Dolphin lights from the excellent ‘Memoirs of a Metro Girl‘ website. 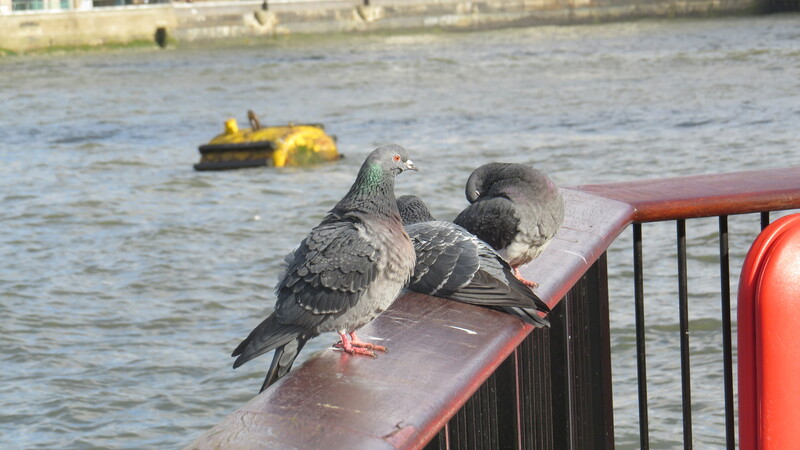 This entry was posted in Bugwoman on Location, London Birds, London Places, London Plants on February 20, 2016 by Bug Woman. 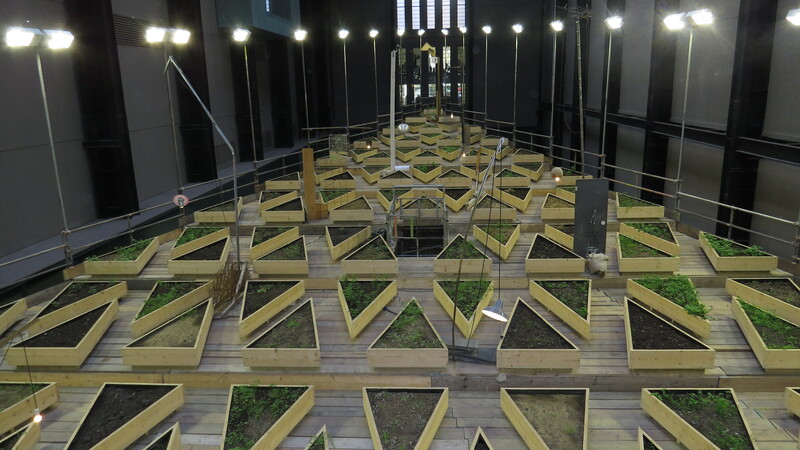 I visited the Tate installation last month and thought it was really good and brilliant artistic arrangement when viewed from above. It was a shame though that you couldn’t get closer to see what exactly was growing and from where the soil had been taken. 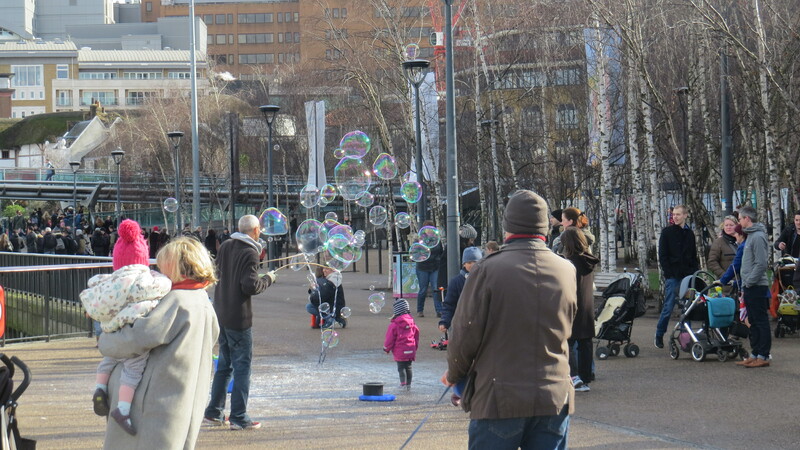 I really liked your south bank stroll photos too… its a great way to spend an afternoon watching the coming and goings of locals, tourists and wildlife enjoying the greatest City! Thanks for sharing your journey! 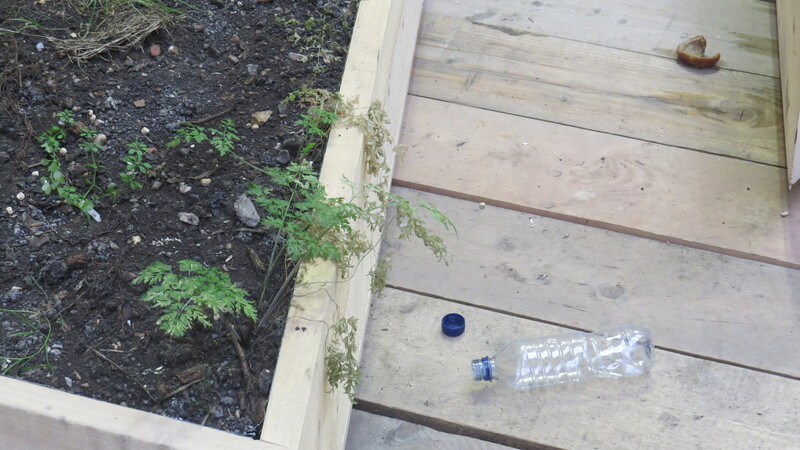 The Tate soil-containers certainly aren’t science and it’s hard for me to imagine how they can qualify as art, either. The UK Wildflowers Facebook page suggestion is a good one: useful science and, who knows, maybe.interesting to look at too.